Lowest Price: GOOD FOR ALL 12 PIN CAMERAS AND LENS! It is a hirose 12 pin straight throught female to jack male extension camera cable. 12 Pin Extension Camera Cable , Good for any cameras. You can connect your cable hirose female side and (SFCC-X01-jack male) connector. Good for any systems contorller. How to connect this cable? Custom Application Cable Assemblies Welcome. 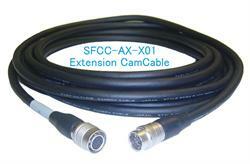 Custom lengths, Right Angle Camcables, and Robotic Extension Camera Cables Available! Download pdf document about detailed configurations of coupler cables.